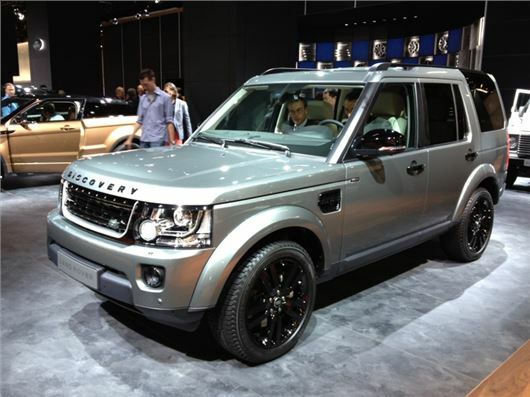 Land Rover has launched the facelifted Discovery at the Frankfurt Motor Show. The updated 4x4 gets improved fuel economy, subtle styling changes and improved audio systems. The order books are now open and deliveries will start in the UK from November. At the front the Discovery gets a new grille and bumper plus redesigned headlights with daytime running lights with a distinctive swoop. The badging has changed too with Discovery now written on the bonnet rather than Land Rover. There are also two new alloy wheel designs while the optional Black Design Pack - which includes 20-inch black alloys - is still available. The engine badging no longer features on the tailgate, instead it's moved to the front doors, giving the back a cleaner appearance. Just one engine is available - the 3.0 SDV6 with 256PS and an eight-speed automatic gearbox. It's been improved though with economy up to 35.3mpg and CO2 down from 230g/km to 213g/km meaning a big drop in annual VED. New features for the 2014 Discovery include Wade Sensing, Blind Spot Monitoring, Closing Vehicle Sensing, Reverse Traffic Detection and T-junction Cameras. It will also be available with a Meridian audio system. The standard system has eight speakers and 380 Watts of power, while the Meridian Surround system produces an impressive 825 Watts output and features 17 speakers.